A few days ago, Glen Metropolit was sitting down with his wife, Michlyn, when he finally realized what being nominated for the Bill Masterton Memorial Trophy could mean. "When I was 15, I had my first job at the Canadian National Exhibition where the old Hockey Hall of Fame was, and I used to go in the Hall of Fame at lunch and see all the sticks and trophies," said Metropolit, who earned the nomination from the Boston chapter of the Professional Hockey Writers' Association. "I was talking to my wife and saying; 'Could you imagine, (my name) could forever be on a trophy forever in the Hockey Hall of Fame. It gets me emotional because I know how hard I've worked and how much I love this game." It's fitting that Michlyn was sitting with her husband when he had this revelation because if it weren't for her, Metropolit could be playing somewhere in Europe this season instead of centering the Boston Bruins' second scoring line. "She is the whole reason I'm here," Metropolit said. Metropolit was close to packing up his family, including Olivia, 6, Max, 3, and Esther, 1, and heading back to Europe to play this season. Metropolit played in Finland from 2003-05 and then in Switzerland during the 2005-06 season. He scored 160 points in three seasons overseas and was making good money with a stable hockey job. Life was good. "Going to Europe was a great experience for my family and myself," Metropolit said. He made it back to the NHL last season, but despite a rather successful campaign split between Atlanta and St. Louis, no NHL team had called him by the middle of the summer. Metropolit was getting worried, but Michlyn was confident. She stood her ground. "The summer just dragged on and I was getting to the point where I was like; 'I can't believe this is really happening, no team is willing to give me a deal,' " Metropolit said. "I was close to saying let's just go back overseas and enjoy ourselves and not worry about all this other stuff that is happening here. You get caught in politics with the game over here. I was so ready to pack it up." When Michlyn showed her resolve, her husband picked up the phone and called Bruins coach Claude Julien, whom he met while playing for Team Canada at the 2006 World Championships. Julien was Canada's assistant coach. "I told Claude I'm willing to come to camp and show you that I want to be part of the team," Metropolit said. "I wanted to learn how to play the systems, and hopefully something could work out. Hopefully I could show them what they had in me." So Metropolit, 33, showed up as an unsigned, free-agent tryout. "It was a hit to the pride a little bit, but I had confidence in myself to come into camp and win a job," he said. "It felt weird being the older guy in the auxiliary dressing room with the 17- and 18-year-olds, but like the old saying, if you get lemons make lemonade. It was a whole good experience, and you have to earn a job every year anyway. I have never had a two-year deal in my career." Metropolit should be able to relax this summer. He's been good enough this season that if it's not Boston GM Peter Chiarelli that wants him back come July 1, odds are at least one of the remaining 29 general managers will. This same guy who grew up as one of three children to a single mother in the "Cabbage Hill" section of inner-city Toronto, who played in the ECHL, IHL, AHL and even Roller Hockey International, has finally broken down what for years had seemed like the impenetrable wall to the NHL. He vaulted up the Bruins' depth chart when center Patrice Bergeron (concussion) was lost for the season, and has played in every game this season, contributing with 11 goals and 19 assists. Last season, Metropolit combined for 12 goals and 19 assists in 77 games with the Thrashers and Blues, who acquired him at the trade deadline. 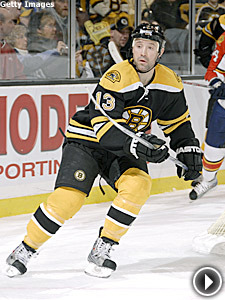 He had previously played in just 103 NHL games spanning four seasons from 1999-2003. "I had big contract offers in Europe (this past summer), but it's not about the money," Metropolit said. "It's about proving people wrong, and just believing in myself. I always knew I could play at this level. I was just waiting for an opportunity." Michlyn knew it would come.